When the master MyConferenceTime schedule (or any schedule) is exactly how you want it to be, it is ready to be copied to each of the staff members who need a copy. We also have video instructions – grab some popcorn! 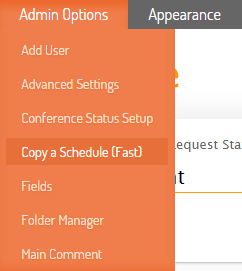 From the drop-down menu at the top, select the schedule to be copied (usually this is the master schedule that you created). Select the names of the staff members who should have this conference schedule in their accounts. Note 1: Click on “Check all” to select everyone in the list. You can then uncheck the names who should not receive a copy of the schedule. Note 2: Usually principals, administrative assistants and guidance counselors do not have conference schedules. If they should not receive a copy of the schedule, the box beside their names should not be checked. Note 3: If the schedule you selected in step 3 belongs to a staff member, you probably don’t want to give that staff member another copy of the schedule. If this is the case, the box beside his/her name should not be checked. Click on “Duplicate Schedule” at the bottom of the screen. Depending on how many teachers are receiving the new schedule, there could be a wait of several seconds (few teachers) to a couple of minutes (dozens of teachers). Please be patient and don’t click anything else while the process is running. When the copy process ends, you will receive a confirmation on the screen that the schedules have been copied.